Beginning October 2013, LibraryThing is sponsoring a new reading group, inspired by "One City, One Book" and "The Big Read," and designed to bring LibraryThing together as a community to read and talk about one book a month: fiction, non-fiction, new books and classics. Here was the introductory post on the Blog. Other One LT, One Book posts can be found here. 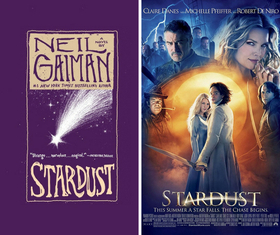 Our selection for June 2018 is Neil Gaiman's Stardust. See the blog post for details. Stardust discussion is live!. Please feel free to start your own threads about Stardust. When starting a new thread, please make your title in the following format "Stardust: [Thread Subject]". We're combining OLOB with our 2nd-ever LibraryThing Movie Night, and will be watching the film adaptation of Stardust (same name) on Friday, June 29th, 9pm EDT. Thinking about joining us for this group read? Say hi in the "Introduce Yourself" thread, and feel free to post as you're reading in "First Impressions". To help things along, we've added the ability to hide spoilers within Talk. You can hide spoiler-y text in your posts by using the "spoiler" tag. See the blog post for more details.